Season chicken lightly with salt. Heat a large wok over high heat. When the wok is very hot, add half of the oil, then add the chicken. Stir fry, stirring occasionally until the chicken is cooked through and browned, about 3-4 minutes. With a slotted spoon, remove the chicken and set aside. Reduce heat to medium. Add the remaining oil to the wok; add the garlic and ginger, stir for 20 seconds. Add the mushroom, snow peas, and carrots, stirring over medium high heat until peas and carrots are tender but still crisp, about 3-4 minutes. 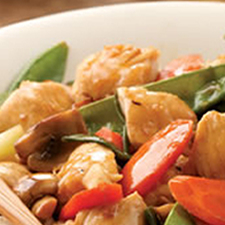 Return the chicken to the wok, add the soy sauce mixture, mix well and cook another 30 seconds to one minute. Serve immediately and top with chopped green onion. *COOK'S NOTE: To be able to slice chicken very thin, place in freezer until just starting to freeze. This makes the raw chicken very easy to slice very thin. Per Serving (about 1 cup): 212 Calories; 5g Fat (22.1% calories from fat); 1g Saturated Fat; 29g Protein; 12g Carbohydrate; 3g Dietary Fiber; 66mg Cholesterol; 242mg Sodium. Exchanges: 0 Grain(Starch); 3 1/2 Lean Meat; 1 1/2 Vegetable; 0 Fruit; 1/2 Fat.